Software: MYOB, MS Office, MS Windows, etc. Something else? Just tell us and we'll figure it out for you. Not sure what it is that you need? That's ok. We can assess your computing requirements and recommend IT equipment and services that best meet your needs and budget. 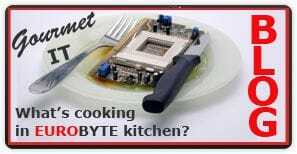 We can buy and install everything for you, so you can enjoy your new computer system in no time. We bring our IT consulting expertise and your computer equipment and services right to your home or office. You don't have to go anywhere. We come to you. From the Hornsby Shire to Drummoyne and Leichhardt, from Carlingford over Ryde and Gladesville to North Sydney and everywhere in between, we provide expert onsite IT consulting and also bring your new computer or other computing eqipment to your door. No call-out fee! 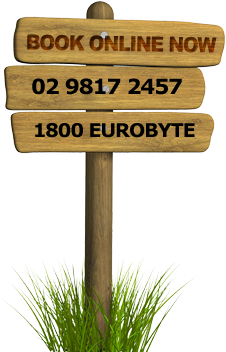 Please check our Onsite Service Area and if you can’t find your suburb feel free to give us a call on 1800 EUROBYTE or (02) 9817-2457 to discuss your options. Computer Deals 2 You is our online computer shop where we list some of our computer bargains, so please visit and have a look around... you may find just what you've been looking for (and at the right price). You are most welcome to visit us at our workshop in Boronia Park to discuss your computing wants and needs. For how to find us please visit our Contact Us page.